Something happened to us when we got to Thailand. Maybe it was the rough time we had in Egypt just before or the fact we hadn’t been to a beach in 9 months. Maybe it was the somewhat inconvenient timing of our arrival 12 days before my mom’s arrival in Bangkok which required us to double back (more on this later). Maybe it was the fact that we knew we had a plane ticket booked home and we wanted to squeeze everything we could in before it happened. 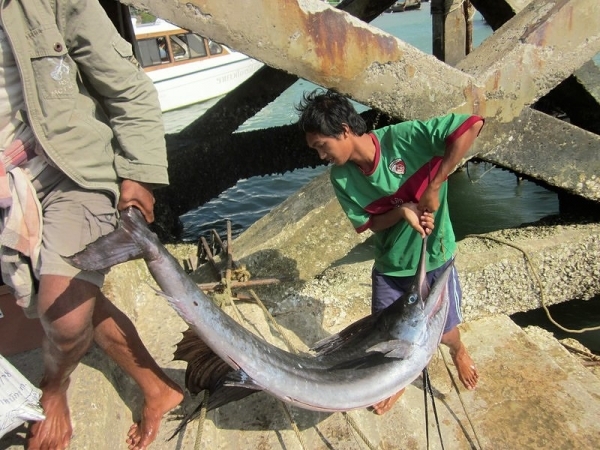 Or it could have been the heat or something we caught from all the other SE Asia backpackers. It was probably a little of each of these things. Whatever it was, we threw our tried and tested travel style out the window and got it in our minds that we needed to see “everything” in the short time we had left. Big mistake! We found ourselves beach hopping, trying to see every place anyone had recommended to us. It didn’t take long before we wore ourselves out. Or before we realized that, in the end, a beach is a beach is a beach. Thailand’s beaches are all same same but different. Our first month of beaching it in Thailand was poorly planned and poorly executed. We felt like we spent way too much time on trains and buses, packing and unpacking our bags, and searching for hotels and vegetarian-friendly eateries. This is why we’ve never liked the “3 days and move” rule that so many travellers seem to live by. We usually consider three days to be an absolute minimum. It’s not until after three days that you start to get a real feel for a place. Jan. 11 – Arrive in Surat Thani in the morning, take shuttle to (tourist) bus station, wait for bus to Krabi, wait for ferry to Koh Lanta (which turns out to be a minibus that takes the car ferries). 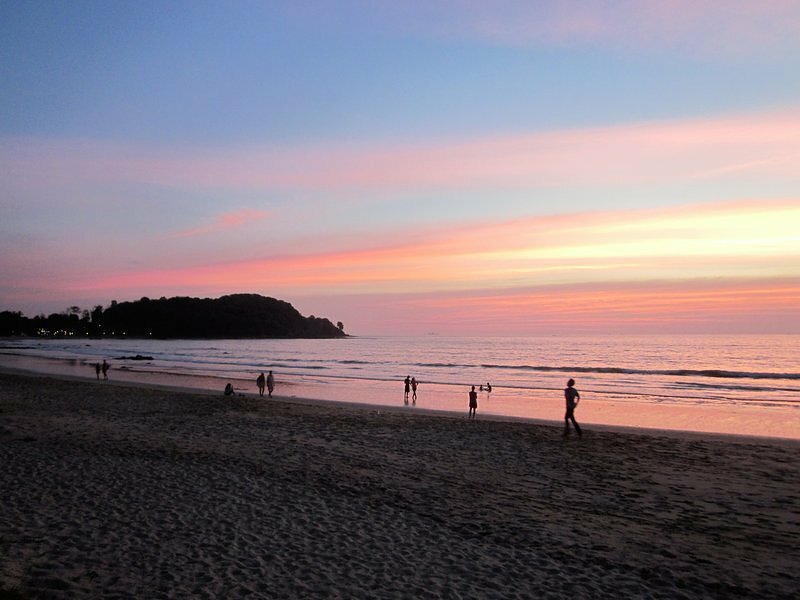 Arrive in Koh Lanta at about 4 pm to discover all the cheap guesthouses are fully booked. Should have booked ahead. 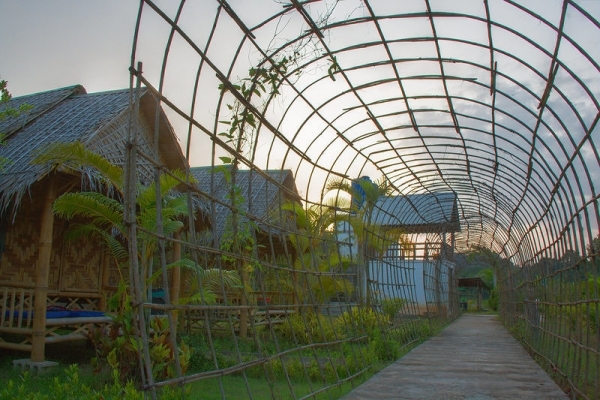 Book a budget-busting (800 baht/$26 CAD) bungalow on beach. We do the math – it took us 59 hours to get here from Cairo. 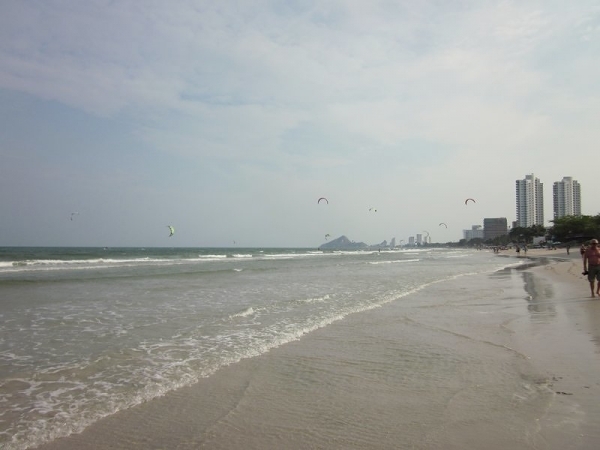 Jan. 12 – Relax on beach. Ahhhh!!! We could get used to this. Jan. 13 – Move guesthouses to cheaper one in town. This one only has room available for 2 nights. We want to stay three. Doh! 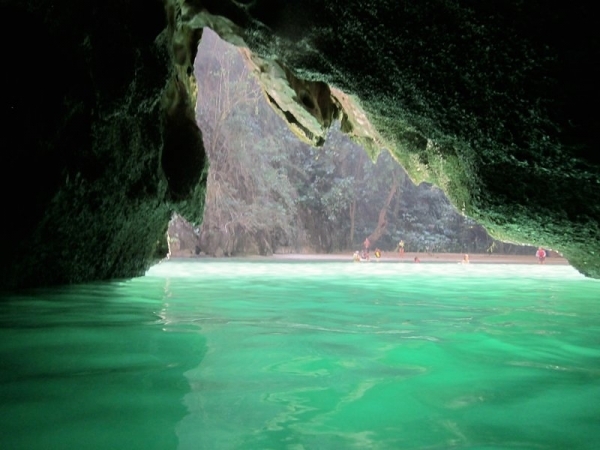 The lagoon emerges… the light at the end of the tunnel! Snorkelling at one of the islands. They feed the fish, so there are lots to see. Jan. 15 – Move guesthouses to another cheap one in town since ours is full tonight. Again, knock head against wall for not booking ahead. Jan. 16 – Catch ferry to Ao Nang. Nearly toss our cookies. Ticket includes free transport to hostel which is not, as advertised, in Ao Nang. Arrive in the middle of nowhere (aka the jungle just outside of Ao Nammao). 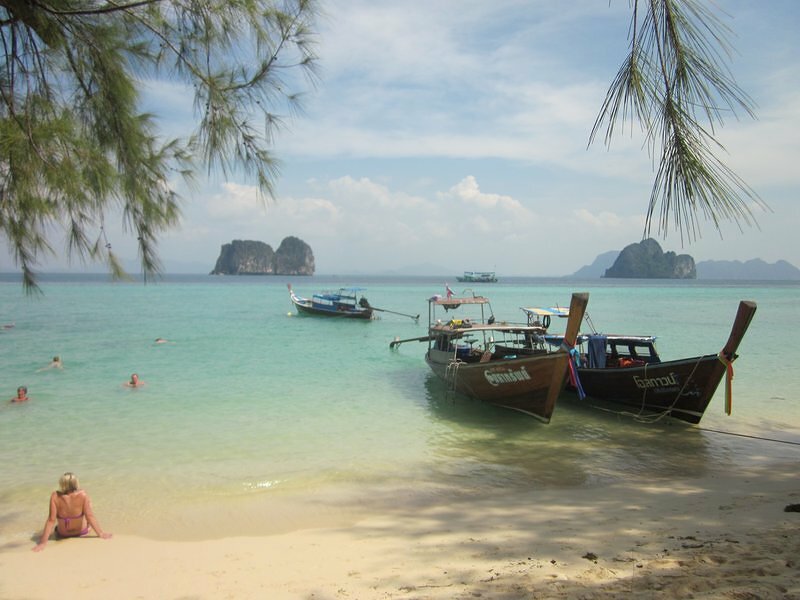 Jan. 17 – Catch longtail boat to Railay Beach (only about 30 minutes, after walking 45 minutes into town from guesthouse). Monkeys steal our bananas. Discover the roped off swimming area is infested with hundreds, if not thousands, of jellyfish, but the rest of the water is surprisingly not. Return the same way to find something amiss in our room (didn’t think too much of it, but later put the puzzle pieces together to discover 100 Euros had been stolen from our locked luggage that was inside our locked bungalow). Really not liking this guesthouse much. Jan. 18 – Check out, leave luggage at front desk, and head back to Railay Beach. No longtail boats are heading back and we have a bus booked to Bangkok, so we have to charter one. They give us a good deal considering. Return to jungle bungalows, take minivan to Surat Thani and get on night bus. Jan. 19 – Arrive in Bangkok at the ungodly hour of 5 am. Taxi to hotel rips us off, but we’re too tired to care too much. Hotel lets us check in early (as in immediately) and we take a long, long nap. Wake up and explore a little of Bangkok. Jan. 20 – Bangkok sightseeing. Jan. 21 – Move hotels. Meet up with Mom! Jan. 26 – Beaching & visiting at Hua Hin. Catch a night bus to Chumphon. Arrive at 3:30 am. Have to wait until 7 am to catch ferry. 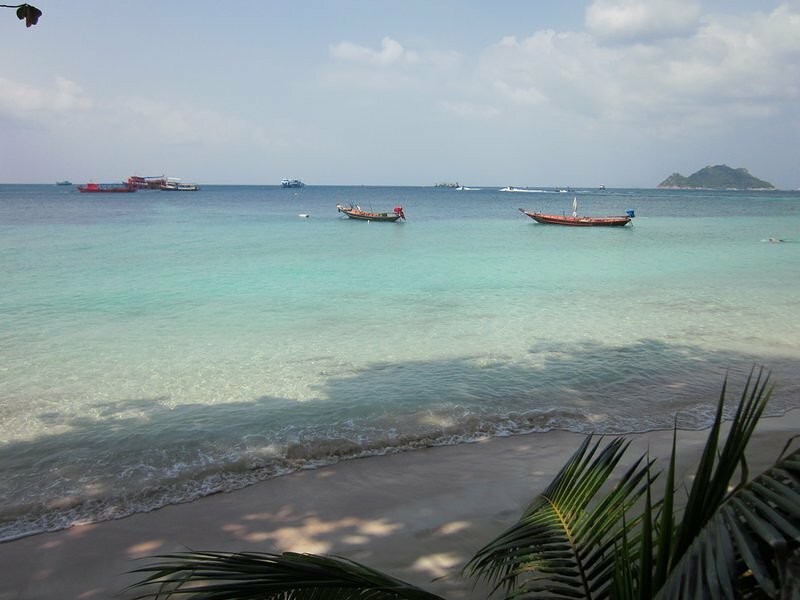 Jan. 27 – Take ferry to Koh Tao. Spend our day wandering the town searching for a good dive shop. Jan. 28 – After nearly a year, we’re finally back in the water. Two dives (and a little seasickness for Ashley). 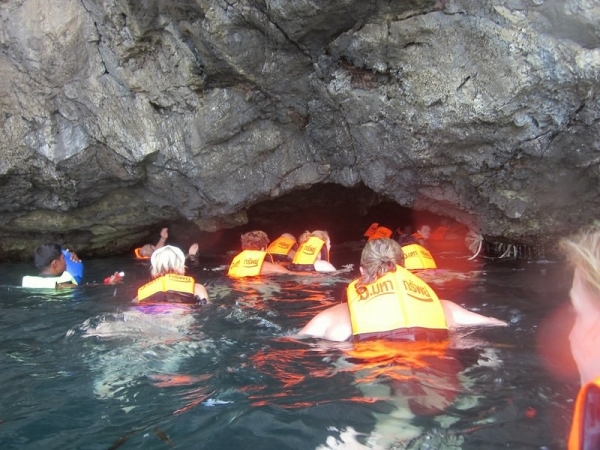 Jan. 29 – Diving at Koh Tao. 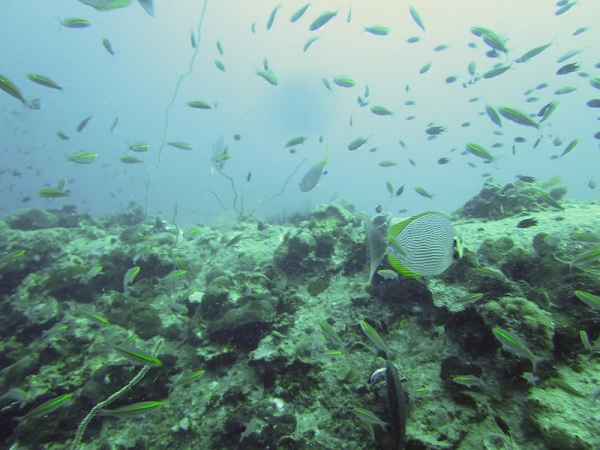 Jan. 30 – Diving at Koh Tao. Jan. 31 – Diving at Koh Tao in the morning. Catch ferry to Koh Phangan in the afternoon. Feb. 1 – Walk the very very hilly southeastern road to the Full Moon Party beach (not for the party which wasn’t happening today, just for the beach). Rest up for the walk back. Feb. 2– Take it easy in the morning instead of beaching it (Ashley wasn’t feeling so hot) and then catch a ferry to Koh Samui. Meet our old travel pal Talon and his son Tigger from 1Dad1Kid. Couchsurf with them. Feb. 3 – Hang out with Talon and Tigger for the day. Catch up on some blogging and photos. Feb. 4 – Hang out with Talon and Tigger and walk to the mummifed monk on the island. 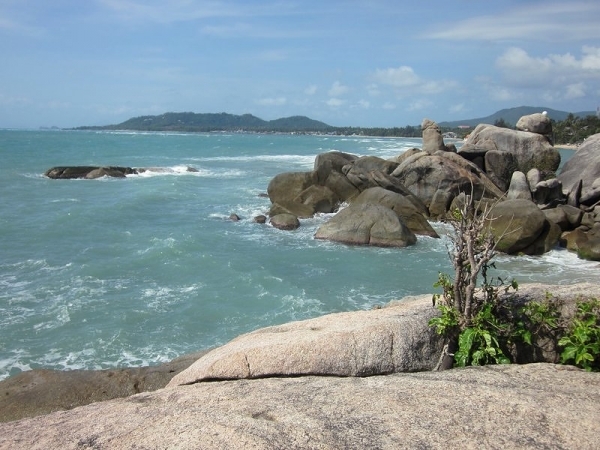 Feb. 5 – Go admire the Grandmother & Grandfather rocks on Samui. Catch a boat and then a bus to Bangkok. Have to leave at around noon… won’t arrive until 5 am the next morning. Feb. 6 – Arrive in Bangkok at 5 am. Check into hotel and sleep. Run errands around town in preparation for tomorrow’s trip to Cambodia (need passport photos, train tickets, and camera cleaning supplies). Exhausting, right? If you’re keeping track, that’s 4 night buses/trains and 5 other travel days in our first 30 days in Thailand. Not to mention 3 extra hotel moves within the same location. 6 different islands/beaches (plus the 4 islands from the tour). And 6 days spent in Bangkok over 3 separate trips. What were we thinking? Now, we did see some amazing sights and we’re glad went everywhere we did. We just wish we hadn’t tried to cram it all into 30 days. We would have been a lot happier picking just one or two of these amazing beaches and relaxing there for a while. Our favourite beach? It might surprise you. 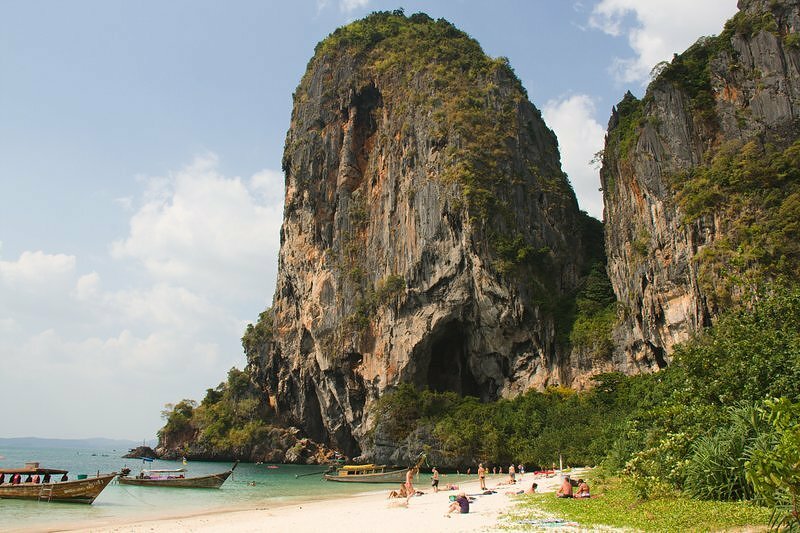 While we really loved the laid back vibe of Koh Lanta and Railay Beach’s scenery was worth the crowds, I might just have to pick Koh Ngai. And I only spent an hour or two there. It’s a tiny island we stopped at for lunch during our four island tour. While a little crowded at lunch time (a lot of longtail boat tours stop here), it would be total paradise the rest of the day – no roads, no noise, just 2 km by 4 km of white sand beaches, turquoise waters, and dense green jungle. Koh Ngui… talk about paradise! It’s a balancing act. We tend to see a lot of places, get burnt out, see only one place for a long while, then repeat. A happy medium is probably best. It actually still sounds doable to me. But I’m just reading, of course:) The only thing I would thoroughly dislike is the changing sleeping locations all the time. We usually never book in advance, but we’ve done a lot of low season travel. This was the peak season, and we just were not used to that. The thing about a hectic travel schedule is that it’s doable for a short while. But when you are on the road as long as we were, spending half of your time on buses and moving hotels is way too much.